Environmental Clean Technologies Ltd (ASX:ECT) provides the 2018 Annual Report to shareholders. 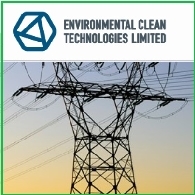 Environmental Clean Technologies Limited (ASX:ECT) is pleased to provide the following update on the progress of its project in India and local activities. Environmental Clean Technologies Limited (ASX:ECT) is pleased to advise it has received its 2018 financial year R&D Tax Incentive Refund. Environmental Clean Technologies Limited (ASX:ECT) presented its Matmor technology at the Global Steel Innovations Forum, held in Dubai last week. Environmental Clean Technologies Limited (ASX:ECT) is pleased to provide the following update on the progress of its project in India. The directors present their report, together with the financial statements, on the consolidated entity consisting of Environmental Clean Technologies Limited (ASX:ECT) and the entities it controlled at the end of, or during, the year ended 30 June 2018. Environmental Clean Technologies Limited (ASX:ECT) entered a Trading Halt on Friday 10 August 2018, and subsequent Voluntary Suspension on Tuesday 14 August 2018 to allow it to confer with its project partners, NLC India Limited and NMDC Limited to prepare the following update. 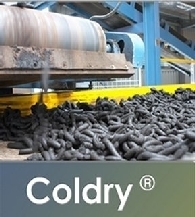 Environmental Clean Technologies Limited (ASX:ECT) is pleased to announce the signing of a binding contract for the sale of Coldry solid fuel in the Victorian market via the provision of a turnkey solution for steam services. 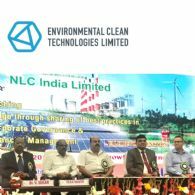 Environmental Clean Technologies Limited (ASX:ECT) is pleased to provide the following update on the progress of its India project with partners NLC India Limited and NMDC Limited. Environmental Clean Technologies Limited (ASX:ECT) is pleased to provide the following information in relation to its recent shareholder question and answer exercise. Environmental Clean Technologies Limited (ASX:ESI) is pleased to confirm a successful application has been made to the ASX to replace its ticker code. Environmental Clean Technologies Limited (ASX:ESI) is pleased to provide the following general update on its activities in India and Australia. Environmental Clean Technologies Limited (ASX:ESI) is pleased to advise that the 170 million unlisted options issued in March 2016 (ESIOP1) have been approved for exercise under an Equity Lending Facility. Environmental Clean Technologies Limited (ASX:ESI) is pleased to provide the following clarification to yesterday&apos;s announcement regarding the signing of its historic agreement with two prominent Indian government enterprises, NLC India Limited and NMDC Limited. Environmental Clean Technologies Limited (ASX:ESI) is pleased to announce the signing of the Project Agreement with NLC India Limited and NMDC Limited for the largest-ever joint R&D collaboration between Australia and India. Environmental Clean Technologies Limited (ASX:ESI) is pleased to announce that the NLC and NMDC Boards have provided their endorsed documents for execution of the final Project Agreement at the scheduled signing ceremony in Canberra on 30 May 2018. Environmental Clean Technologies Limited (ASX:ESI) provides the following update in relation to the timing of the signing ceremony for its India Project. Environmental Clean Technologies Limited (ASX:ESI) is pleased to announce the commercial terms of the Master Project Agreement ahead of the scheduled signing ceremony in Canberra on the 24th of May 2018. Environmental Clean Technologies Limited (ASX:ESI) is pleased to provide the following statement regarding provisions within the Federal Budget that impact the business. Environmental Clean Technologies Limited (ASX:ESI) is pleased to provide the following update on the forthcoming visit to Australia by its India Project partners NLC India Limited and NMDC Limited, in addition to updates on relevant supporting activities. Environmental Clean Technologies Limited (ASX:ESI) advises that as of 23 April 2018 it has changed its provider for shareholder registry services from Security Transfer Australia Pty Ltd to Automic Registry Services. Environmental Clean Technologies Limited (ASX:ESI) provides the following update in relation to the previously announced proposed visit to Australia by its Indian project partners. 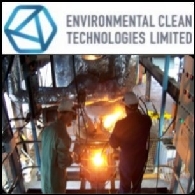 Environmental Clean Technologies Limited (ASX:ESI) is pleased to announce the completion of the &apos;basic design&apos; for the Matmor component of its planned India project. Environmental Clean Technologies Limited (ASX:ESI) is pleased to provide the following update on the progress of the external, independent financial review (the Review) of its proposed Coldry-Matmor project in India. Environmental Clean Technologies Limited (ASX:ESI) is pleased to provide the following update on the progress of its activities in India in support of its world-first technology project with partners NLC India Limited and NMDC Limited. Environmental Clean Technologies Limited (ASX:ESI) is pleased to provide the following update on the progress of Coldry solid fuel commercial trial activities in the Victorian and Tasmanian markets. Environmental Clean Technologies Limited (ASX:ESI) is pleased to advise it has received its 2017 financial year R&D Tax Incentive Refund. 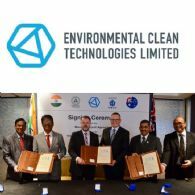 Environmental Clean Technologies Limited (ASX:ESI) is pleased to announce the signing of a term sheet for a R&D Rebate loan facility through to January 2020 in support of the Company&apos;s India project. Environmental Clean Technologies Limited (ASX:ESI) is pleased to provide the following update on the Group&apos;s Coldry commercialisation program. 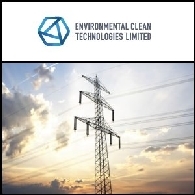 Environmental Clean Technologies Limited (ECT or Company) (ASX:ESI) is pleased to announce it has concluded the Techno-Economic Feasibility (TEF) study in support of its proposed project in India. 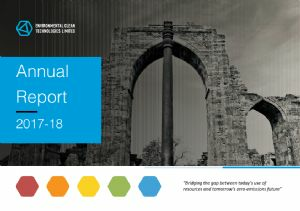 Environmental Clean Technologies Limited (ASX:ESI) (ECT or Company) is pleased to confirm it has again been highlighted in the Annual Report of YES BANK. Environmental Clean Technologies Limited (ASX:ESI) is pleased to provide the following update to shareholders on its Coldry-Matmor project in India. Environmental Clean Technologies Limited (ASX:ESI) is pleased to provide the following general update to shareholders. Environmental Clean Technologies Limited (ASX:ESI) (ECT or Company) is pleased to provide the following half-year report to shareholders. 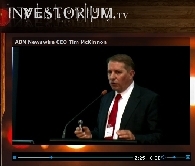 AUDIO: Environmental Clean Technologies Limited (ASX:ESI) Managing Director Ashley Moore Talks with ABN Newswire on the Coldry and Matmor technologies. Environmental Clean Technologies Limited (ASX:ESI) (ECT or Company) provides the following general update on recent company achievements, current activities and planned activities. Environmental Clean Technologies Limited (ASX:ESI) is pleased to announce that it has finalised a loan facility agreement with Innovation Structured Finance Co., LLC, a specialty finance company established by Brevet Capital, a New York City based investment manager. 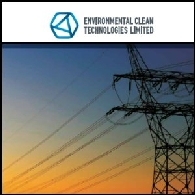 Environmental Clean Technologies Limited (ASX:ESI) (ECT or Company) is pleased to announce it has secured a binding agreement to proceed with project development initiatives for its Coldry and Matmor technologies with India&apos;s national lignite authority, Neyveli Lignite Corporation (NLC) and India&apos;s largest iron ore miner, NMDC Ltd.
Environmental Clean Technologies Limited (ASX:ESI) (ECT or Company) is pleased to advise the date for signing the Tripartite Collaboration Agreement (TCA) has been agreed and set for Tuesday 19 January 2016. Environmental Clean Technologies Limited (ASX:ESI) gets a Letter of Intent with K-Coal Co., Ltd of Korea in respect of equity participation in ECT&apos;s Coldry Commercial Demonstration Plant. Environmental Clean Technologies Limited (ECT or Company) (ASX:ESI) advises that following meetings in South Korea it has signed a Memorandum of Understanding (MoU) with Korean based energy company K-Coal Co. Ltd. The MoU provides KCoal with exclusive sales and marketing rights into Korea for ECT&apos;s Coldry technology. Environmental Clean Technologies Limited (ASX:ESI) (ECT or Company) is pleased to announce the successful completion of a placement of A$695,000. An additional A$405,000 has also been identified, however this amount will be subject to shareholder approval at an Extraordinary General Meeting (EGM) at a date to be fixed. The Environmental Clean Technologies Limited (ECT) (ASX:ESI) Annual General Meeting was convened today at 11:00 AM and the Chairman and Managing Director, Mr Mike Davies delivered the following Chairman&apos;s Address. Environmental Clean Technologies Limited (ECT) (ASX:ESI) is pleased to announce the commencement of the Design for Tender for its flagship Victoria Coldry Project. Environmental Clean Technologies Limited (ASX:ESI) is pleased to announce the signing of a co-operation agreement with Tincom of Vietnam as the first step towards re-establishing the Victoria Coldry project. Directors and Executives from Melbourne brown coal drying technology company Environmental Clean Technologies (ASX:ESI) have re-opened discussions with former partner Tincom of Vietnam. Environmental Clean Technologies Limited (ASX:ESI) wishes to provide an update on the following areas; (1) Executive team; (2) Non-Renounceable Rights Issue; (3) Private Placement. 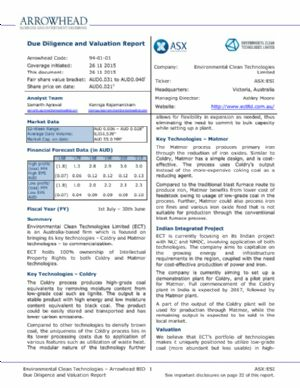 Environmental Clean Technologies Limited (ASX:ESI) is pleased to provide the following update to shareholders with respect to our Coldry patent in Australia. Environmental Clean Technologies Limited (ECT) (ASX:ESI) is pleased to provide the following update on the various options it is progressing in the commercialisation of its Coldry (Black Coal Equivalent (BCE)) technology and its plans to undertake preparatory work for the establishment of a large scale Coldry production plant to be located at the Loy Yang Power Station in Victoria&apos;s Latrobe Valley. Environmental Clean Technologies Limited (ASX:ESI) announces the appointment of Mr Iain McEwin as a new director effective today. Environmental Clean Technologies Limited (ECT) (ASX:ESI) is confident the results of tests and its technical and market experiences will underpin the next phase of the commercialisation of the Coldry technology. The Datang test burn planned for late 2011 is expected to provide concrete evidence of the suitability of Coldry pellets for use in black coal power plants and will be a major step in the commercialisation process. Environmental Clean Technologies Limited (ASX:ESI) announces the resignation of Mr John Hutchinson as a Director of ECT with immediate effect and the appointment of Mr Michael Davies as a new director effective today. 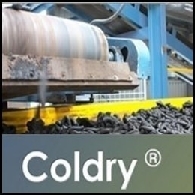 Environmental Clean Technologies Limited (ASX:ESI) is pleased to provide a comprehensive update on the status of our Coldry technology. Environmental Clean Technologies (ASX:ESI) is pleased to announce the appointment of Mr. Warrick Boyle to the position of Manager - Product Development & Operations, underpinning the recently expanded production role of our Coldry Pilot plant and advancement of our Coldry project in Victoria&apos;s Latrobe Valley. Environmental Clean Technologies Limited (ASX:ESI) is pleased to announce that it has signed a Coal Supply Agreement (CSA) with global &apos;Fortune 500&apos; company China Datang Corporation subsidiary, China Datang Overseas Investment. Environmental Clean Technologies Limited (ASX:ESI) is pleased to announce the deposit today of funds by Thang Long Joint Investment Stock Company (TinCom) to provide initial cash funding for the Joint Venture company Victoria Coldry Pty Ltd (VCPL). Environmental Clean Technologies Limited (ASX:ESI) is pleased to announce it has executed a Joint Venture Agreement and received a Parent Company Guarantee from its partner, TinCom of Vietnam, giving practical effect to the License Agreement issued to our incorporated joint venture company, Victoria Coldry Pty. Ltd. for the project to construct a 2 million tonne per annum Coldry, Black Coal Equivalent, production plant in Victoria&apos;s Latrobe Valley. Environmental Clean Technologies Limited (ASX:ESI) is pleased to advise it will be providing a Small Shareholdings Sale Facility to shareholder with a holding of less than A$500 worth of ordinary shares (called a Small Shareholding). Environmental Clean Technologies Limited (ASX:ESI) announce it has signed its first local Coldry sale with Maryborough based BAIC Protein, from its Coldry pilot plant in Bacchus Marsh, Victoria. 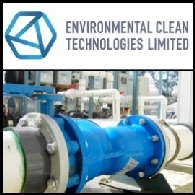 Environmental Clean Technologies Limited (ASX:ESI) announce that the collaborative upgrade of its Coldry pilot plant with JC Steele has concluded successfully. 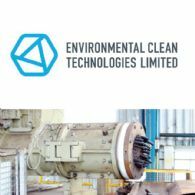 Environmental Clean Technologies Limited (ASX:ESI) is pleased to provide the Chairman&apos;s and Chief Executive&apos;s addresses at today&apos;s Annual General Meeting. Environmental Clean Technologies Limited (ASX:ESI) provides the following update on its headline project for the Coldry process in Victoria&apos;s Latrobe Valley with Vietnamese partner TinCom. Environmental Clean Technologies Limited (ASX:ESI) Proposed Issue Of US$2,500,000 Convertible Notes To La Jolla Cove Investors, Inc.
Environmental Clean Technologies Limited (ECT or Company) (ASX:ESI) wishes to announce it is currently in advanced discussions with La Jolla Cove Investors, Inc. in respect of a financing arrangement which is expected to be implemented in late October 2010. Under the agreement governing the financing arrangement, the Company will issue a series of convertible notes to La Jolla Cove with a total issue price of up to US$2,500,000. Environmental Clean Technologies Limited (ASX:ESI) has taken another step toward commercialising its revolutionary Coldry brown coal drying technology, forming a strategic alliance with United States based global equipment supplier JC Steele & Sons. Environmental Clean Technologies Limited (ASX:ESI) is pleased to announce that the company&apos;s Coldry Chinese patent application no. 200480031850.2 has now been issued as a patent. The official patent number is ZL200480031850.2. FINANCE VIDEO: Environmental Clean Technologies (ASX:ESI) CEO Kos Galtos Speaks at The Brisbane Trade And Investment Expo 2010. Environmental Clean Technologies Limited (ASX:ESI) wishes to advise it is performing test work on iron oxide samples provided by Gulf Mines Limited (ASX:GLM) from its Nowa Nowa deposit, using our Matmor process. Melbourne technology commercialisation company Environmental Clean Technologies Limited (ASX:ESI) is set to sign an historic license agreement with Vietnamese company Thang Luong Investment and Joint Stock Company (TinCom). Melbourne technology commercialisation company Environmental Clean Technologies (ASX:ESI) is set to sign an historic license agreement with Vietnamese company Thang Luong Investment and Joint Stock Company (TinCom). Environmental Clean Technologies Limited (ASX:ESI) wishes to announce it has received the independent report titled Advancing Matmor: Identifying Attractive Markets, which delivers on the market analysis recommendations made by HATCH in their technical analysis announced on 15 February 2010 (Matmor Advancement Update). Environmental Clean Technologies (ASX:ESI) wishes to announce that following on from recent discussions, it has concluded the negotiation of a final Term Sheet with Thang Luong Investment and Joint Stock Company, (TinCom) of Vietnam, enabling the licensing of the Special Purpose Vehicle (SPV), Victoria Coldry Pty Ltd to manufacture and market Coldry Black Coal Equivalent (BCE) pellets. 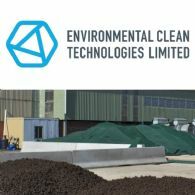 Environmental Clean Technologies Limited (ASX:ESI) cash position was strengthened to A$2,223,025 at 31 December 2009, primarily from a capital raising of A$2.64 million (before costs and expenses) via a Placement of new shares and options to institutional, experienced and sophisticated investors. Environmental Clean Technologies Limited (ASX:ESI) announce, subsequent to the disclosure at our AGM on 18 November 2009, outlining the results of the Matmor report by HATCH and the intended path moving forward, we are pleased to provide the following update on advancement activities. 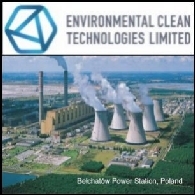 Environmental Clean Technologies Limited (ASX:ESI) has signed a Memorandum of Understanding (MoU) with ELBIS Sp.z o.o (ELBIS), a wholly owned subsidiary of the State-controlled power utility Polska Grupa Energetyczna S.A. (PGE), to co-develop a localised business case for a Coldry plant in Poland. ABN Newswire stocks to watch today include: Universal Resources Limited (ASX:URL), Marion Energy Limited (ASX:MAE) (PINK:MAEJF) and Environmental Clean Technologies Limited (ASX:ESI). Environmental Clean Technologies Limited (ASX:ESI) wishes to announce its Victorian coal-drying and export project has advanced to the next stage with the formation of the Special Purpose Vehicle (SPV) with Vietnam based TinCom. 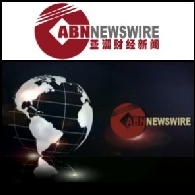 ABN Newswire stocks to watch today include: Bauxite Resources Limited (ASX:BAU) (PINK:BXRDF), Liberty Resources Limited (ASX:LBY) and Environmental Clean Technologies Limited (ASX:ESI). Environmental Clean Technologies Limited (ASX:ESI) advises that on 4 January 2010 The Australian Taxation Office (ATO) issued a cash refund (refundable R&D Tax Offsets) including interest amounting to A$257,672.27 to ECT in relation to the 2007 financial Year. Environmental Clean Technologies Limited (ASX:ESI) Message from the Chief Executive, Kosmas Galtos. Environmental Clean Technologies Limited (ASX:ESI) is pleased to announce that it has completed a capital raising through a placement of new fully paid ordinary shares and listed options (Placement). Environmental Clean Technologies Limited (ASX:ESI) is pleased to report on the formation of a Special Purpose Vehicle (SPV), Coldry East Kalamantan Pty Ltd with Alexis Minerals International for the establishment of a Coldry production plant in East Kalimantan, Indonesia. Environmental Clean Technologies Limited (ASX:ESI) has signed a Memorandum of Understanding with Great Energy Alliance Corporation Pty Ltd (GEAC) to participate in the upcoming feasibility study for ECT&apos;s first scaled up Coldry production facility at GEAC&apos;s Loy Yang Power facility. Environmental Clean Technologies (ASX:ESI) is pleased to announce the appointment of Mr Ashley Moore to the position of Business Manager, Coldry. Mr Moore is a seasoned Chemical Industry professional with extensive experience in all facets of Manufacturing, Supply Chain, Sales and Industrial Marketing. 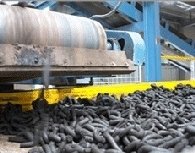 Environmental Clean Technologies Limited (ASX:ESI) wishes to announce that it has received confirmation from Thang Long Investment and Commercial Joint Stock Company (TinCom) that Vietnam&apos;s Ministry of Planning and Investment has issued the necessary licence for the company to proceed with its investment in the production of Coldry pellets in Australia. Environmental Clean Technologies Limited (ASX:ESI) wishes to announce that it has received written confirmation from its partner TinCom that it has received in principle agreement from Vietnamese Prime Minister Nguyen Tan Dung to allow it to invest in the production of Coldry pellets in Australia. Environmental Clean Technologies Limited (ASX:ESI) wishes to clarify that recent press reports, including Dow Jones Newswires, announcing that Vietnamese Prime Minister Nguyen Tan Dung has provided public, in principle, agreement to allow Thang Long Investment and Commercial Joint Stock Company (TinCom) to invest in the production of Coldry pellets in Australia, have not been confirmed to the company directly by TinCom or the Vietnamese government. Environmental Clean Technologies Limited (ASX:ESI) wishes to advise that John Osborne has commenced in the role of Company Secretary. Mr Osborne is an experienced Company Secretary with extensive finance and corporate development acumen and is a strong replacement for Jan McPherson who completes her current commitments to the company today. 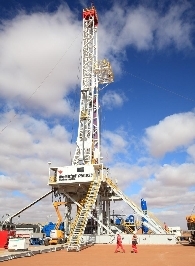 Environmental Clean Technologies Limited (ASX:ESI) wishes to advise it has entered into an agreement with the controller of the Matmor technology (the Maddingley Group) to extend the milestones for the development and construction of the first Matmor plant to the end of 2014. This is important because the milestones need to be achieved to secure ECT&apos;s rights. Environmental Clean Technologies Limited (ASX:ESI) wishes to advise it now owns the Coldry IP and is ready to bring this world-class technology to full commercialisation. Environmental Clean Technologies Limited (ASX:ESI) wishes to advise it has signed a Coordination Agreement with Thang Long Investment and Commercial Joint Stock Company (TinCom), which seals the deal on the establishment of a Special Purpose Vehicle (SPV) to invest funds into a feasibility study for the construction of a Coldry plant licensed to produce up to 100 million tonnes per annum of Coldry over the next five decades. 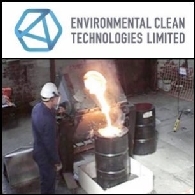 Environmental Clean Technologies Limited (ASX:ESI) wishes to advise it has engaged Hatch, who are recognised globally as leaders in metallurgical process technologies and advanced furnace design, to perform a review and assessment of commercial development of the Matmor process for iron making. Environmental Clean Technologies Limited (ASX:ESI) is pleased to announce the successful completion of its capital raising, with total funds raised of A$3,487,805.26 out of a maximum A$3,500,000. Environmental Clean Technologies Limited (ASX:ESI) wishes to advise it has made significant progress on the Thang Long Investment and Commercial Joint Stock Company (TinCom) opportunity. 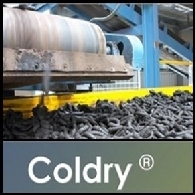 Environmental Clean Technologies Limited (ASX:ESI) advises that negotiations on the formal agreements to acquire the intellectual property rights in the Coldry technology (Coldry Technology) from the unitholders of the Maddingly Coldry Unit Trust (Coldry Trust) are continuing, but have not been concluded. 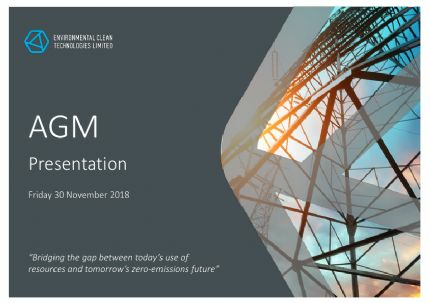 Environmental Clean Technologies Limited (ASX:ESI) announces that the amount raised under its Share Purchase Plan has increased to approximately A$2.3 million, comprising approximately A$1.3 million from eligible shareholders and approximately A$1 million from the Underwriters of the offer. The Company expects to raise further funds from applications for the shortfall shares and options. Environmental Clean Technologies Limited (ASX:ESI) is very pleased to advise that Stephen Carter has agreed to join the Board of Directors. Environmental Clean Technologies Limited (ASX:ESI) announces that it expects to have raised approximately A$2.1 million pursuant to its Share Purchase Plan. The offer closed at 5:00pm on Thursday 30 April 2009. Applications were received from eligible shareholders for approximately A$1.1 million, and the Underwriters are committed to taking up a further A$1 million. 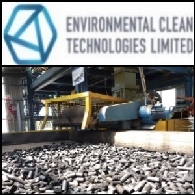 Environmental Clean Technologies Limited (ASX:ESI) advises that coal samples from Ilthabi Bara Utama (IBU) coal mine in East Kalimantan have responded successfully to Coldry testing. Environmental Clean Technologies Limited (ASX:ESI) has reached agreement with Indonesian coal mining company Ilthabi Bara Utama (IBU) to commence initial testing of low rank coal samples from its East Kalimantan mine for suitability for application of the Coldry process. Environmental Clean Technologies Limited (ASX:ESI) advises that it has terminated the subscription agreement with Pacific Capital Value Limited (&apos;PCVL&apos;) dated 18 November 2008 (&apos;Subscription Agreement&apos;) by mutual arrangement with that company. Environmental Clean Technologies Limited (ASX:ESI) has signed a Heads of Agreement for the staged investment in a Special Purpose Vehicle (SPV) by a Vietnamese-based company, to establish a plant for the production of 20M tonnes per annum of Coldry, black coal substitute, over the next 30 years. Yesterday the Asian major bourses posted losses, driven by negative sentiment caused in large part by doubts over the financial rescue package in the US and profit-taking. The US President Barack Obama was sending Congress a budget that projects the government&apos;s deficit for this year will soar to US$1.75 trillion, reflecting efforts to pull the nation out of a deep recession and a severe financial crisis. 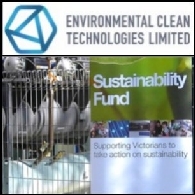 Environmental Clean Technologies Limited (ASX:ESI) advises that commercial negotiations with Victoria Capital, for the purchase up to 20M tonnes of Coldry per year for 20 years (Letter of Intent announced 18 November 2008) are progressing productively. Environmental Clean Technologies Limited (ASX:ESI) advises that on 20 January 2009 The Australian Taxation Office (ATO) issued a cash refund (Research and development tax offset) including interest amounting to $263,307.90 to ECT in relation to the 2006 financial year. Environmental Clean Technologies Limited (ASX:ESI) advises that it has issued 11,000,000 shares and 32,000,000 options to Fiori Pty Ltd (Fiori). The shares were issued at a price of 2 cents per share. The options (Options) are 2 free attaching options for each share issued on the capital raising and may each be exercised at any time prior to 16 January 2014 for one fully paid ordinary share at an exercise price of 2 cents. Environmental Clean Technologies Limited (ASX:ESI) confirms that documentation to establish the A$10M Zero Coupon Convertible Note facility with Pacific Capital Value Fund has now been executed. Environmental Clean Technologies (ASX:ESI) has successfully recovered 100% of the iron from nickel tailings using its unique Matmor technology, making it an ideal feedstock for foundries and allowing companies to offset costs. 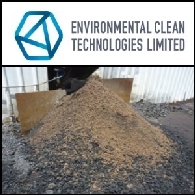 Environmental Clean Technologies Limited (ASX:ESI) has received the results of independent testing of the Coldry pellet by HRL Technology confirming it is an ideal product for use in new brown and black coal fired power stations. 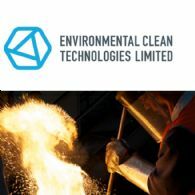 Environmental Clean Technologies Limited (ASX:ESI) advises that the patented Matmor single step steel making process that utilises a blend of brown coal and iron ore to create cleaner, low carbon steel, has been put to the test with a shipment of Mongolian brown coal. 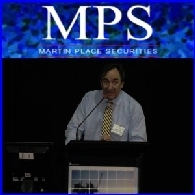 Environmental Solutions International Limited (ASX: ESI) - Update on Market Potential - Mr Con Galtos, CEO; Environmental Solutions International Limited (ASX: ESI) present the following audio webcast regarding "Update on Market Potential". You may also download this audio webcast to your computer or portable audio player.